Heat oven to 350°F. In small bowl, combine all ingredients except spareribs; mix well. Set aside. Line 15x10x1-inch baking pan with foil; place wire rack in pan. 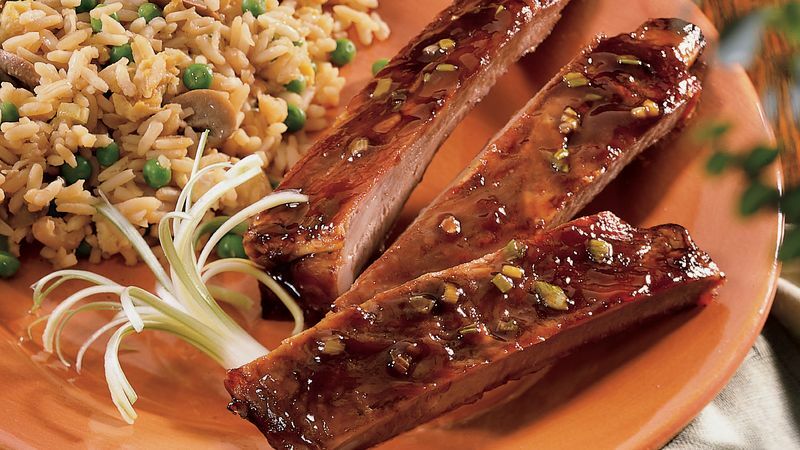 Place ribs on wire rack, meaty side up; brush with sauce. Bake at 350°F. for 1 1/2 to 2 hours or until meat is tender and starts to pull away from bones, brushing frequently with sauce. To serve, cut ribs apart carefully with knife and arrange on platter. Oyster sauce is a dark brown sauce made by cooking oysters with soy sauce and brine until the mixture is thick and concentrated. The rich flavor of oyster sauce is popular in Asian stir-fries and as a condiment to Asian foods. Garnish the ribs with green onion brushes. To make brushes, trim the onions to 3-inch lengths and make several length-wise cuts through each onion, leaving about 1 inch of white onion intact. Place in ice water until cut onion curls back.